In early September I wrote a post that examined prior instances where the S&P 500 Index moving averages triggered the death cross signal. In the article I concluded the death cross generally has triggered near market bottoms versus signalling further market weakness. The death cross is where the 50 day moving average crosses the 200 day moving average from above. The most recent death cross was triggered on August 27th and as the below chart shows, this was only two days after the s&p 500 Index bottomed. Subsequent to the death cross, the S&P 500 index is up 4.4% and appears to be replaying those "V-shaped" recoveries investors are becoming accustomed to of late. In hindsight, had investors simply bought stocks when the market was down over 10%, they obviously would have enjoyed a more significant bounce off the bottom. The significance of the double digit decline in this cycle is the fact the market had not experienced one for nearly four years until this August. For investors then, some technical indicators are more predictive of future stock or index movements than others. In the case of the Death Cross, it is an interesting conversation topic; however, it appears not to be a reliable sell indicator and in fact may be a signal to buy. The Dogs of the Dow theory suggests investors select the ten stocks that have the highest dividend yield from the stocks in the Dow Jones Industrial Index (DJIA) after the close of business on the last trading day of the year. Once the ten stocks are determined, an investor invests an equal dollar amount in each of the ten stocks and holds them for the entire next year. With the first 10-months of the year nearly behind us, the Dow Dogs for 2015 are trailing both the Dow Jones Industrial Index and the S&P 500 Index on a price basis. 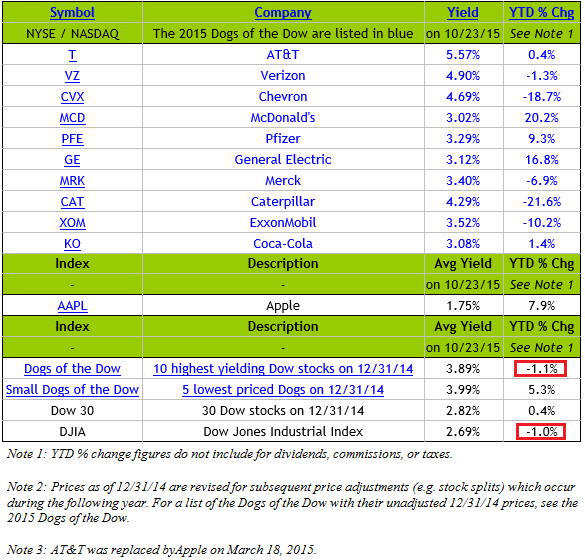 The below table shows the performance of this year's Dow Dogs compared to the DJIA. For reference, the S&P 500 Index is up .79% through the market's close on Friday. The weak links in the Dow Dog strategy this year are the energy stocks, ExxonMobil (XOM) down 10.2% and Chevron (CVX) down 18.7%. The industrial stock Caterpillar (CAT) has also contributed to the underperformance as the stocks is down 21.6% YTD. 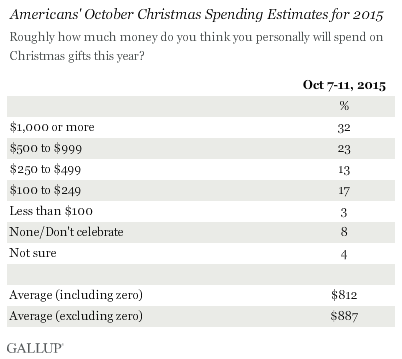 the majority of Americans routinely say they will spend about the same as they did the previous year, the 20% saying they will spend less is down from 24% in October 2014, and is the lowest Gallup has recorded for any October since 2007.
a third of U.S. adults plan to spend $1,000 or more on gifts and another quarter say they will spend between $500 and $999, while about a third will spend between $100 and $499. 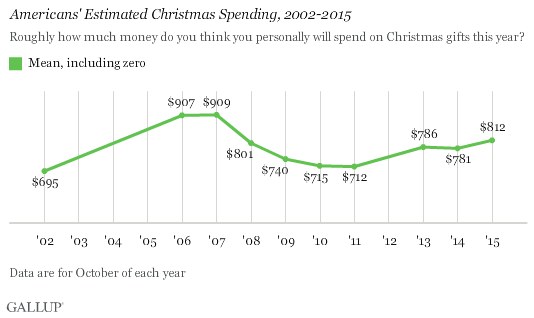 Another 3% plan to spend less than $100, while 8% say they will not spend anything. At mid-year of 2014 West Texas Intermediate (WTI) crude oil prices were trading over $100 per barrel. Just over a year later, WTI is now priced at just under $50 per barrel. This steep fall in crude prices has confounded the market from the standpoint of the magnitude of the price decline. Is the price decline simply a reaction to elevated supply due to the growth of fracking or has worldwide oil demand fallen as a result slowing global growth? We briefly address this issue in our Fall Investor Letter, but following is a closer look at oil supply and the performance of energy related investments. The first two charts below compare the performance of the SPDR Energy Sector ETF (XLE) to the percentage change in the price of WTI. 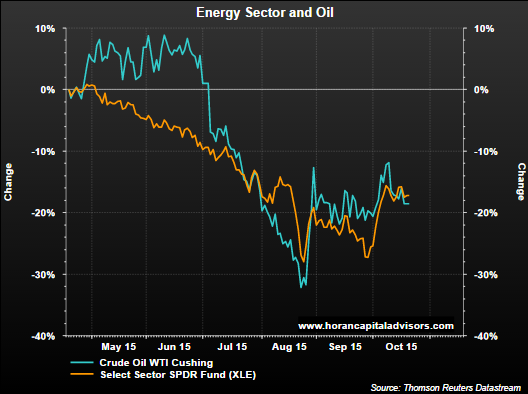 As the first chart shows, the SPDR Energy Sector Fund ETF held up better as WTI's price began to fall beginning in 2014. One question for investors is whether the relative outperformance of XLE is justified or might it resumes its decline in order to catch up to the fall in WTI's price. The second chart compares the same two assets but on a shorter six month time frame. In this chart both XLE and WTI are once again trading in sync with one another. At HORAN we do believe the issues impacting oil are more supply related, yet acknowledging the continued "bump along the bottom" economic growth rate around the world. Iran indicates it will increase supply at any cost and Saudi Arabia continues with the desire not to reduce production levels. 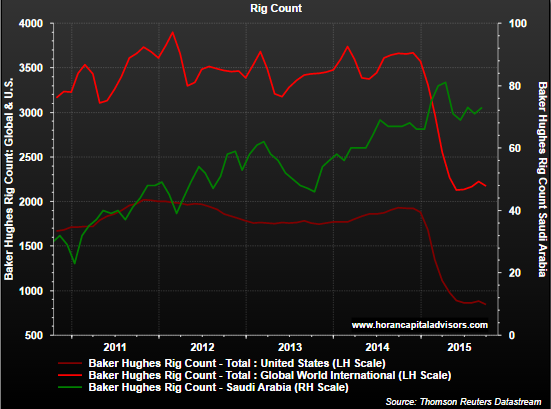 The green line in the below chart shows the rig count in Saudi Arabia and the chart clearly shows they have not reduced rig levels unlike in the U.S. and globally. Finally turning to supply, the green line in the below chart shows the unabated oil inventory growth in the U.S. since late 2014. 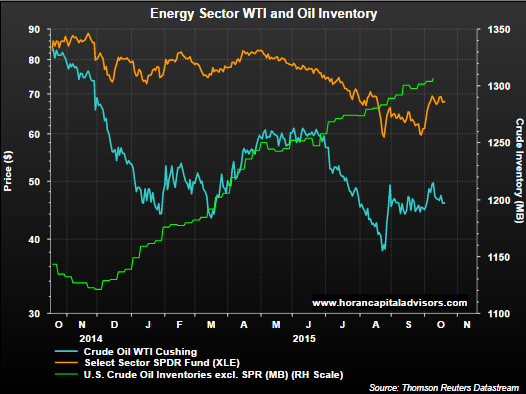 The currently high inventory levels seem not suggestive of an oil market where crude prices are likely to move higher in the near term. 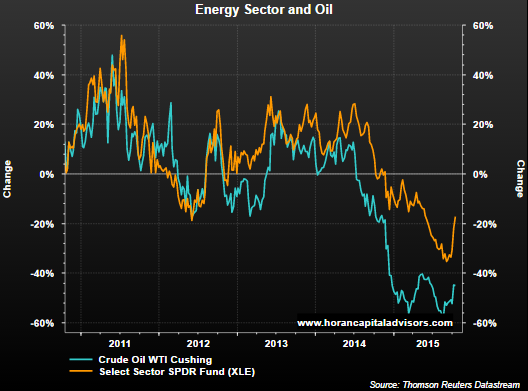 And this downward pressure on oil prices will likely be a continued headwind for energy related investments. In our recently published Fall 2015 Investor Letter we discuss the long awaited third quarter market correction and issues issues facing companies in the fourth quarter and the first half of 2016. Prior to the market decline that began in May, the S&P 500 Index climbed higher for nearly four years without incurring a greater than 10% correction; however, based on current price to earnings multiples, U.S. large company stocks are trading at average valuation levels compared to historical data. U.S. company earnings are expected to decline 4.8% in the third quarter compared to the third quarter of 2014. Excluding the greater than expected 60% year-over-year decline in energy sector earnings, the balance of companies are expected to report an increase in earnings of about 2%. A decline in earnings is generally associated with the onset of recessions; however, as noted in the newsletter, an earnings recession does not always precede economic recessions. U.S. company earnings reports are facing the headwinds from a stronger U.S. Dollar while energy and materials company earnings are being pressured by low oil prices. The newsletter notes this earnings weakness is expected to be transitory with growth resuming in the first half of 2016 when year over year earnings comparisons to prior quarters become easier. Based on current price to earnings multiples, U.S. large company stocks are trading at average valuation levels compared to historical data. Additionally, it seems reasonable to believe recent earnings weakness is temporary and concentrated in the commodity and energy sectors. While worldwide growth has slowed and the risk of a global recession is heightened, we believe a U.S. recession is unlikely at this time; however, investors should be prepared for a higher level of market volatility in this environment. While short-term volatility can rattle investor confidence, it is important to maintain a view of the horizon and the opportunities and rewards of longer term investing. Since mid 2011 emerging market equities began to underperform the U.S. equity market (S&P 500 Index). Earlier this year we noted in a post, Emerging Markets Not Out Of The Woods Yet, the headwind a stronger U.S. Dollar can have on emerging market equity performance. 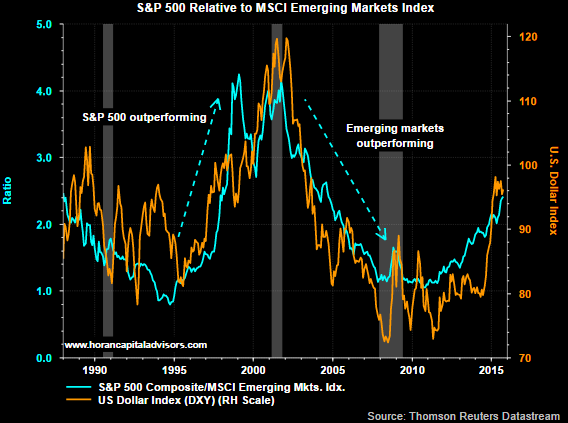 The updated chart below continues to show the accelerated strengthening of the Dollar (orange line) and the underperformance of the MSCI Emerging Markets Index relative to the S&P 500 Index. The U.S. Dollar tends to move in an average cycle of about seven to eight years and this cycle is about four years old. A number of factors can contribute to a stronger Dollar. One factor is a higher interest rate trend in the U.S. and the Fed's desire to raise rates continues to place an upward bias on the Dollar. Outflows from U.S. exchange-traded funds that invest in emerging markets more than doubled last week, with redemptions exceeding $12 billion in the third quarter. Withdrawals from emerging-market ETFs that invest across developing nations as well as those that target specific countries totaled $566.1 million compared with outflows of $262.1 million in the previous week. The losses marked the 13th time in 14 weeks that investors withdrew money from emerging market ETFs and left the funds down $12.4 billion for the quarter, the most since the first quarter of 2014, when outflows reached $12.7 billion. For September, emerging market ETFs suffered $1.9 billion of withdrawals. As difficult as it can be to predict currency moves, getting the directional call correct will likely be a factor that influences emerging market returns over the next several years. A stronger Dollar will serve as a headwind and a weaker one could be a positive for emerging market equities. 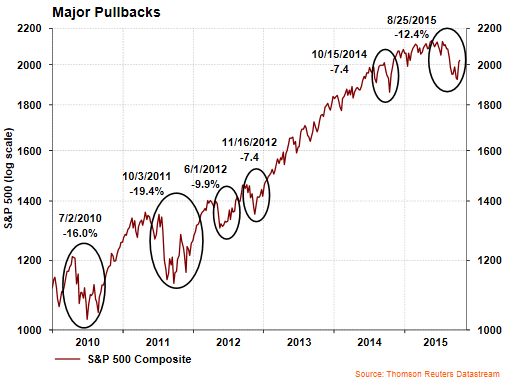 Will The Equity Market Finish The Year In Positive Territory? A portion of the recent equity market volatility can be attributed to the fact a number of factors seem to be at critical turning points. At top of mind seems to be the focus on the timing of the Fed's move to begin increasing/normalizing interest rates. Historically, a tightening of interest rates has led to a slowdown in economic activity. Added to this is the fact corporate profit growth is forecast to be negative as we noted in a recent post, A Few Positive Equity Market Technicals. These two issues alone, a Fed wanting to tightening and weak corporate profit growth, both are playing a part in the market's recent pullback. "...going back to 1928, the S&P 500 has never been positive year-to-date after being down more than six percent after the third-quarter. 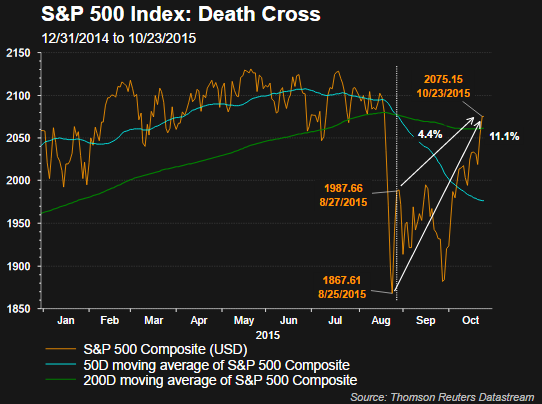 The S&P 500 was down 6.74% after the third-quarter in 2015." In the article, he notes the average decline through the third quarter in the 23 years the S&P 500 Index was down was a negative 16%. For this year though, he notes the three quarter decline is -6.74% and is the best starting point for for any of those years. He goes on to note, for the S&P to finish the year in positive territory, the fourth quarter return would need to equal about 7.23%. More insight can be gained by reading his article. 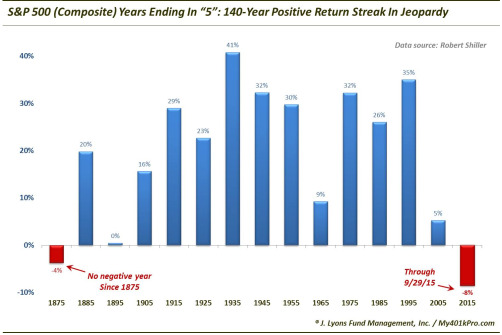 "going back 140 years, every year ending in a "5" has posted a positive return since 1875. In other words, the last 13 years ending in "5" have left stock investors "high-fiving" each other. It is likely mainly due to coincidence, with a healthy dose of positive Presidential Cycle “Year 3″ tailwind mixed in for several of the years. Nevertheless, it is a consistent and compelling track record." So there you have it, computer algorithms might just force the continuation of the year 5 winning streak or they might decide to force the negative year streak noted in Ryan Detrick's article. Fortunately, as noted in Ryan's article, the market is at the best starting point for negative returns through three quarters. 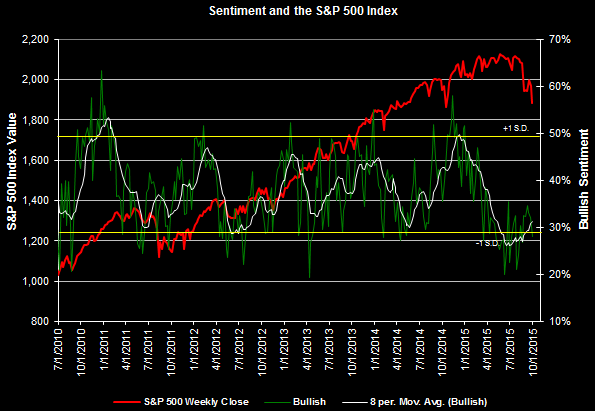 Since mid March the AAII bullish sentiment reading has been below its long term bullish average. As a contrarian indicator, low levels of bullish investor sentiment typically point to equity markets that are near their bottom. Keeping in mind though, this sentiment reading is most predicative at its extremes. Earlier this week, the AAII bullish reading declined 4 percentage points to 28.1% and the bearishness reading jumped 11 percentage points to 39.9. The bullishness level is now more than one standard deviation below its long run average. In addition to a low level of bullishness for individual investors, the recent release of the NAAIM Exposure Index declined to 16.39%, down from 21.34% in the prior week. The NAAIM Exposure Index represents the average exposure to US Equity markets reported by NAAIM members. NAAIM member firms who are active money managers are asked each week to provide a number which represents their overall equity exposure at the market close on a specific day of the week, currently Wednesdays. Responses are tallied and averaged to provide the average long (or short) position or all NAAIM managers, as a group. 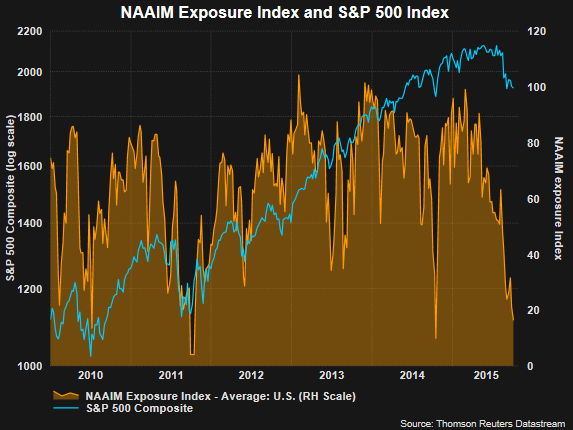 As noted in the below chart, low NAAIM Exposure Index levels have generally coincided with equity market turning points. These various sentiment measures seem to be coming together at the same time to indicate a bearish view of the markets. Since these sentiment readings are contrarian ones, possibly the market is nearing a turning point with stronger returns through the fourth quarter. As we have noted numerous times in prior posts, sentiment measures alone must be evaluated in the context of other market and economic fundamentals. "Higher levels of shareholder return are now part of the market expectation, with many investors anticipating continued high payouts. While companies currently have the resources and low-cost access to funds to continue this trend, once interest rates increase, the higher costs will eventually influence the decision making process for corporate expenditures. Buybacks may be more susceptible to an interest rate hike, given that they are more discretionary and dividend cutbacks are typically seen as a last resort action. Based on the current data, the Q3 actual dividend payment is expected to be the sixth consecutive quarter of new record payments, with Q4 2015 expected to be the seventh." It may simply be a spurious relationship, but the buyback index return began to trail the broader market return since the beginning of the first quarter. 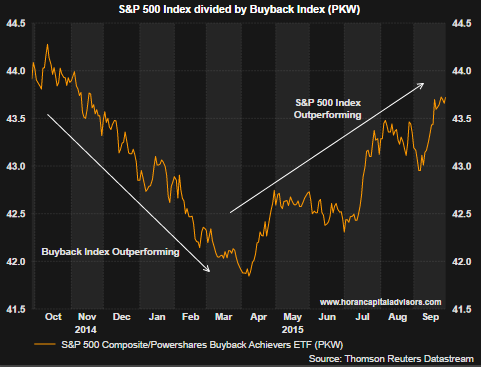 This can be seen in the below chart comparing the S&P 500 Index to the Powershares Buyback Index (PKW). Given the decline in equity prices since the market peaked in late May, companies would benefit from increasing buybacks with their share prices at these lower levels. 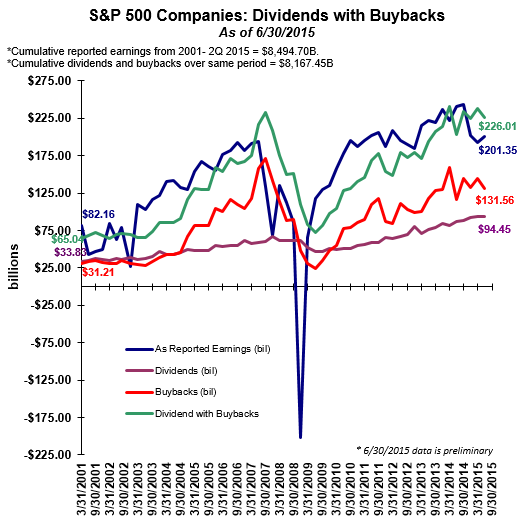 Unfortunately, companies have a tendency to increase buybacks when their shares are near highs. If buybacks do slow in the coming quarters, this will likely be a headwind for an already weak near term earnings growth picture.